The latest episode wastes no time in jumping right back into the swing of things. At the end of last week, Eve took a portal to another world. The team has yet to realize this; so instead, Nick and Adalind are having a little heart-to-heart about Diana. Renard’s mysterious friend thinks Diana is in danger because she can see the symbols, but Nick is hesitant to let Renard help them or tell him where the tunnel full of symbols is. Adalind urges Nick to tell Renard about the tunnels so that he can help. They want to keep Diana safe, though obviously the girl can take care of herself. Meanwhile, Rosalee and Monroe arrive back home and quickly realize Eve managed to create a portal through their mirror and has disappeared through it. They call Nick and Adalind in a panic. Everyone’s pretty upset that Eve went through the portal on her own without telling anyone else. Eve is indeed in another world. She wakes up in a rune-filled, snowy landscape. At first she can see through one of the runes back into Monroe’s house, where Rosalee and Monroe are discussing what happened. But then the window closes and it’s just a rune. Before she can contemplate that for too long, she hears shouts and comes upon a group of Wesen attacking a man who they then drag off, but not before he wounds one of the Wesen. Then another Wesen shows up and kills the wounded one. Eve doesn’t stick around for too long after that. Can’t say I blame her. When Adalind and Nick arrive — with Diana and baby Kelly in tow — Adalind opens the Hexenbiest spell book for them so they can figure out exactly what Eve did. Turns out, Hexenbiest blood can be used as currency to cross into other worlds. As the only other Hexenbiest around, Adalind offers to go in after Eve but Nick, Monroe, and Rosalee all say no. Nick says he’ll go but first he needs to find another way through the portal. He’s brought the Elder Wand with him (we haven’t seen that in a couple episodes). Apparently, all he needs to do is hold the Elder Wand up to the mirror and the portal magically opens right up. Convenient. Nick passes right through, but the stick falls out of his hand as he goes. Diana tells Adalind, Monroe, and Rosalee that the stick can’t pass through because it doesn’t belong there. Nick wakes up in the other world and, just like Eve, he can see a glimpse of what he left behind. He sees Monroe holding the Elder Wand and looking confused and it’s then that Nick realizes it didn’t come through with him. Now he’s stuck in a mysterious land surrounded by runes. At least it seems to have stopped snowing. Nick happens upon another fight (or the same one?) in the woods. Unlike Eve, he just walks right up, because, well, he’s Nick and not known for sound judgment. The Wesen killer runs at him, shouting in German. Nick beats him up pretty good, but the Wesen just pops right back up. Frustrated, Nick declares he doesn’t have time for this and shoots the Wesen, who has clearly never seen a gun before. Unlike in Portland, the Wesen don’t woge back after being killed here. They stay Wesen. Eve comes running when she hears the shots and she and Nick have a good semi-shouting match about her running off through a portal by herself. After they’re done with that, they take off through the woods. It doesn’t take long for the Blutbaden pack to find their fallen friend and start howling. Nick and Eve hear it and start running faster. Back in Portland, Adalind tells Monroe and Rosalee that Renard knows about the symbols. Monroe and Rosalee aren’t happy, and they’re not on board with Adalind’s idea to tell Renard everything. But without any other options, they decide to fill him in and hope he and the mysterious friend can help. Before they call him in though, they call in Hank and Wu, who aren’t at all happy that Nick went to another world without them. They’ve convened at Nick’s house where the tunnel entrance is located and they’ve contacted Renard. They fill him in on everything — the keys, the symbols, the Elder Wand — and show him the tunnels. Adalind tells Renard that Diana is connected to it all somehow and they need to find out how. Meanwhile, in “the other place” — as Diana has named it — Eve and Nick are running for their lives from the Blutbaden pack. Eve also has another problem: she’s slowly starting to woge and doesn’t seem to have any control over it. They happen upon a human encampment. Nick manages to kill a few more Blutbaden and the rest run off when they see the camp. Nick, in his limited German, tries to tell the humans that they won’t harm them. When the humans see the dead Blutbaden, they are a little more trusting and invite Nick and Eve into the camp. One of them speaks a little bit of English. With their limited ability to communicate, Nick is able to explain that he wants to kill the creepy skull guy, whom the humans seem familiar with. They tell him skull guy is in the Black Forest. The humans are pretty friendly once they find out Nick and Eve want to kill this dude. They offer to share their meal with them — freshly killed and cooked Blutbad. Something tells me Nick won’t be telling Monroe he just ate one of Monroe’s distant relatives. The leader of the humans tells Nick and Eve they can find skull guy at the runes. He takes them up to a certain point and then tells them they’re on their own the rest of the way. Back in Portland, Renard and the gang are Skyping with Renard’s mysterious friend. Diana fills her in on skull guy and the place beyond the mirrors. The lady explains that there are other dimensions — parallel universes — that have similarities to our own but are different in big ways. She also says opening a portal to another world or going into another world is a very, very bad thing. As for skull guy, she says that he’s what we would think of as the devil in this world. There is a prophecy, she says, and she believes that Diana could be the shaphat of the prophecy – the person skull guy will take as his bride and have 100 children with. The mysterious lady relays all this in Russian, so only Renard knows what she’s saying. Renard is not too happy to hear there’s a prophecy involving his daughter becoming the devil’s child bride. After they put Diana to bed, Renard tells the team what his friend said and they head to their books to figure out a way to stop skull guy. 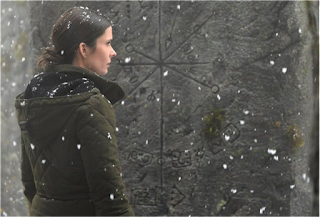 In the other place, Eve and Nick have come back to the runes. A Wesen comes running out and attacks Eve. Nick shoots and kills him. Well, if skull guy didn’t know they were there before, he certainly does now. Despite the imminent danger, Eve and Nick manage to have a heart-to-heart about their past relationship, who they are now, and why it’s good that they’re not the same people they once were. They have just enough time for their chat before skull guy shows up. Skull guy has a magical staff that he uses to blast Nick and Eve back a few feet. They jump up and Nick fires his gun but it has absolutely no effect. Then skull guy’s staff starts glowing green and Eve turns fully into a Hexenbiest. That’s all we get for this week, though! We’ll have to wait until next week to find out what happens next.